We are SOCKED in, with no meltage in sight. School is already canceled for tomorrow. Many, many people in my state are without power, though thankfully my family is toasty warm and wearing out the DVD player. And today, my five year old tried to convince me that the best cure for his headache would be a bowl of Cheetos. That has absolutely nothing to do with the ice, I just thought it was funny. brrrrrrr…..I don’t like ice. Hope you are staying nice and warm. Bowl of cheetos?!? Smart kiddo… I went to the grocery store on way home and bought lots of junk-ish type food. My boyfriend looked at the bags and said “ummm…babe? junk food won’t make it any *more* warm”. Little does he knows. Cheetos, animal crackers, potato chips… Yup. Perfect cure for whatever ails ya! glad to see you’re flying the flag even in oklahoma. that’s usually the kind of snow we get–ice crusted. we missed it this time. stay warm. and stock up on those cheerios. That looks fun, since you don’t have to get out and you still have power. I wish it would make up its mind here in Dallas. We keep hearing we’re getting something but it’s just enough piddly ice to be dangerous and still not shut everything down. Lurker but regular new reader here. I didn’t know you were a Razorback fan!! All the more reasons why your blog is now one of my very favorites! I’m so disappointed kelli in the mirrow took my saying. Love the flag have the same one!!! I am so jealous. I want some snow and ice and hibernating with the dvd player excuses. I hope you all stay safe, though. Looking at those pics just made me realize that I am not homesick for those Montreal winters I grew up with! Glad you’re toasty warm – stay safe. Wow! You all sure have the ice! We received some ice, sleet, snow, but I’m sure there will be school tomorrow. Yuck. Stay warm! Wow, So glad you have power! Here in Orlando our high was 82 today. I’m so glad we only vacation where it snows! Stay warm! That did make one beautiful picture of your bush, though. Try and stay warm Dryer family! I am glad you are not suffering from power outages; the reports coming to the East Coast from your area make it sound really, really bad. 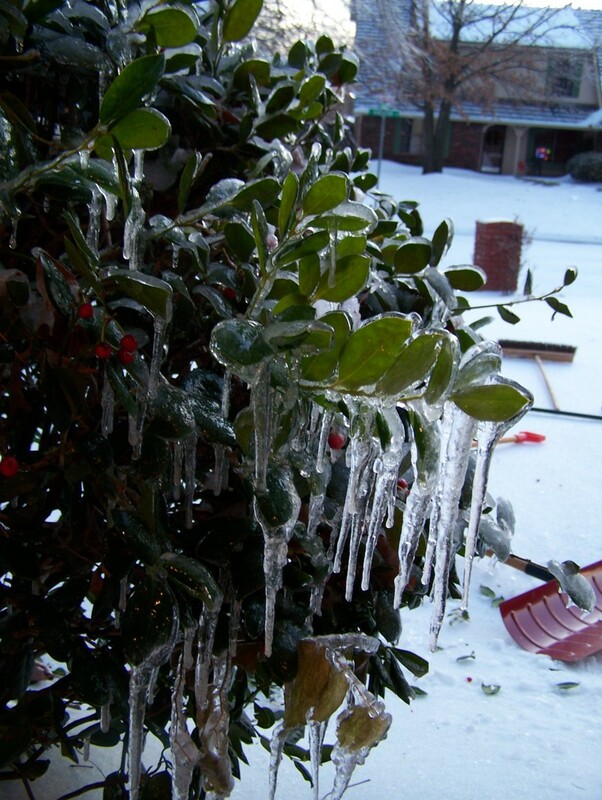 But I am jealous of your lovely winter weather, and the gorgeous ice on your front-door bush. It’s just cold and damp here, and it looks like the storm that hit you will miss us, too. It was 75 degrees here (not normal for the northeast). I’m hoping we at least get one snow/ice day this year. Thanks for sharing the pics. Stay warm! Whoa…that is a lot of ice! Are you in Arkansas??? I just realized we may have that in common if you are! It looks like your boys were a big help! I gave you a plug yesterday on my blog, knowing you were getting it worse and hoping you were not without power. I knew that where you are is worse than here however I have to say my yard looks just like yours as far as the ground. It is NOT snow, it IS ice. My 16 mo old Little King is loving playing on it with his daddy. Tre (hubby) can run and slide across the yard, not even leaving a mark! Glad you have electricity. Did you lose it at all? 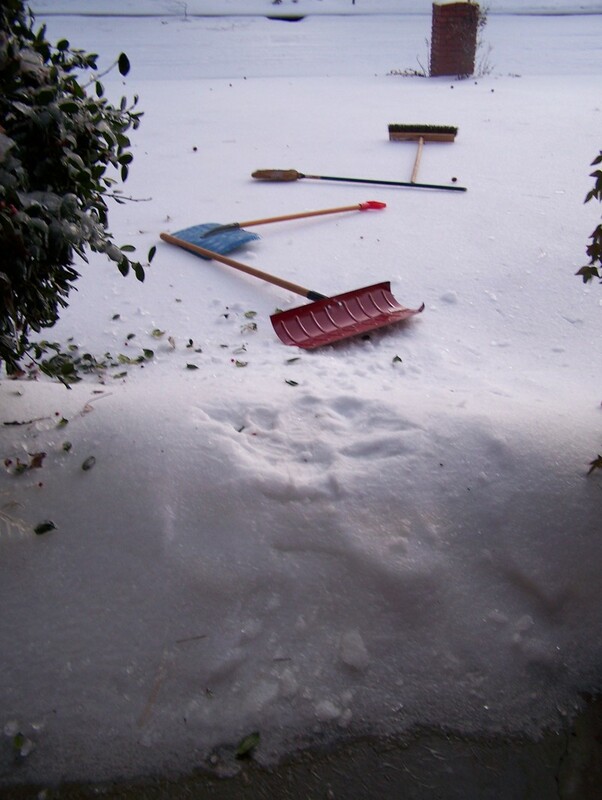 The worst thing about having a snow day today is that it fell on a holiday….the kids were off ANYWAY! Such a waste. There is nothing like watching the news, waiting for YOUR school district to be named for closing. We were robbed!! Glad to hear your staying warm and toasty. and I thought it was bad here in TX- whew! at least school hasn’t been canceled……yet…. Try some salt! It might melt that ice. I laughed when I saw your title to the Blog. I used the same thing a few days ago and my husband said I was telling people how old I was!! We have the same ice here! OUr school is canceled tomorrow as well. THe kids are thrilled..until I told them that they would now be going to school until May 24 instead of May 18 like it said on the schedule. They were bummed!! I am a lurker too! I have been visiting your blog for the last few days and love it! Just wanted to comment on today’s post…great pictures…I would love to see some snow here in Alabama…but doubt that will happen…since it was like 70 degrees yesterday. Cheetos? Too funny! Sounds like my kiddos…they LOVE those things! Oh my goodness! Stay warm inside! I’m glad you are all safe and warm! Maybe winter will someday come to Massachusetts!! We have had similar weather here. I find myself wishing that I had some ice skates so that I could out and get the mail! They would also be nice in the front of my van–to help it stop!!! Woo Pig Sooie….even in the ice! 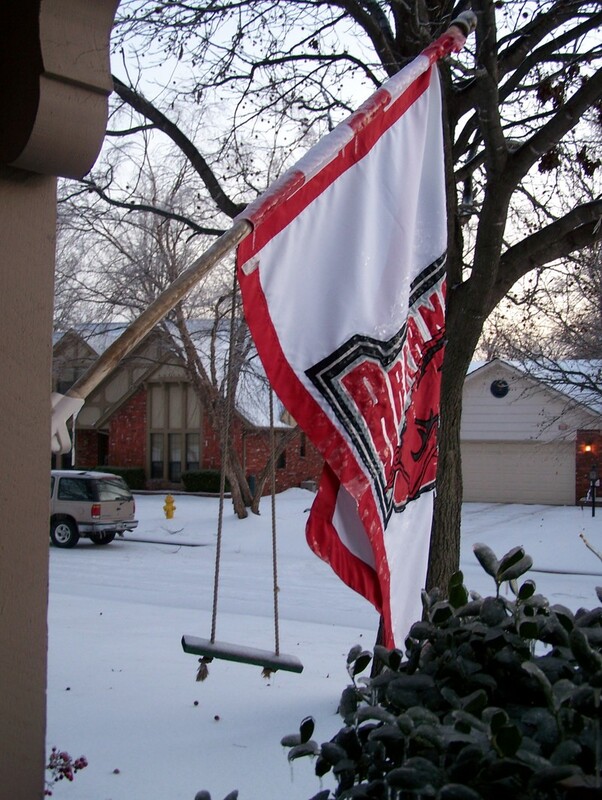 Hawg fans across the country would be glad that their mascot is out displaying your pride, even in the freezing weather! I’m usually just a reader (ok, a lurker), but when I saw my Razorback, I had to comment! Stay warm. And don’t eat too many Cheetos! I love the flag (I have one just like it!) Go Hogs!! Here in Ohio, we have had several days of nonstop rain and my youngest daughter informed me yesterday that water was running down her bedroom wall, so apparently we have a roof leak!! Today it has gotten much colder (temps in the 20’s) and the rain has finally stopped!! I’d be green with envy. If I wasn’t pink from sunburn. It’s pushing 80 here in sunny Florida. We have two seasons. Africa Hot, and Not as Hot. But you know, the grass is always greener over the septic tank. If it was snowing here, I’d be wishing for Spring. Stay warm. Stay safe. And stay indoors! Glad to hear you are all doing well! I’ve thought of you often as I listen to the weather reports. Any idea of when it is all supposed to thaw? Our local nursery has a sign that tells us how long it is until spring. Just 10 more weeks! Cheetos sound like a wonderful headache cure to me! Now I’m wishing I had some here (and I don’t even have a headache!). No snow and ice here, but it is cooler than usual. I’m actually missing that kind of weather. Nothing like a little “forced” hibernation.